Finding your perfect smart lock is hard work. There are so many different models, with lots of confusing features and just how much money should you spend? And are the locks secure enough? But the good news is that you can find a perfect smart lock and at a great price. Controlling your lock with your voice. But, before we do anything else, let’s sort out a proper definition of smart locks. I think that over time the definition of a smart lock has changed. An original definition was a lock that can be opened and closed without using a mechanical key. However, over time, as smart locks have developed and gadgets have generally become smarter, I think that the definition has changed. For me, a smart lock is not only a lock that can be opened without using a mechanical key but it is also a lock that can be “remotely controlled” via a free app. Remote control allows owners of these locks to connect with the locks even when they are not at home. But what are the different types of smart lock? Smart locks come in all shapes and sizes. The easiest way of grouping them is by the main method of opening them. Looking at all the smart locks on sale today, there are 3 main different types. These smart locks have a keypad with numbers from 0 to 9 on them. Users need to create security codes or PINs (personal identification numbers) which will open the lock. These locks are opened when a smart phone is held up to the lock. These locks are opened by people’s fingerprints. There are lots of smart locks available to buy each with a long list of features with which they charm you with. But, what are the most important features to look out for? In my infographic below, I describe 10 features that the perfect smart lock should have. Most smart locks are used on front doors and so it is very important that the main point of entry into your house is secure. With all of the “bells and whistles”that smart locks offer it is easy to lose sight of this most basic requirement. They have 3 standards or grades for residential locks- grade 1, 2 and 3. Grade 1 is the most secure with grade 3 offering a basic residential security. Even the best smart locks will fail to work at times because the batteries that power most of them will run flat. And, no matter how organised you are, your lock might just die on you. Just make sure that the lock that you choose has an emergency way of opening it in the event of a power failure. Other smart locks will use a 9V battery to use in case of a power failure. This is the ability of a smart lock to “play with” other devices, such as security cameras or video doorbells. Smart locks have not traditionally worked with other smart devices, but that is changing now. This is an important feature for a smart lock to have because, if locks can interact with other devices, it will improve your home’s security. This is the ability of a lock to lock itself after the door has closed. It brings peace of mind to owners who are busy and distracted by armfuls of shopping or by young children. A smart lock that auto locks is one less task that you need to do! The best smart locks can be installed with just a Phillips screwdriver. Well, that is as long as you are replacing an existing lock and don’t have to drill a hole in a brand new door! Because smart locks are powered by batteries there are no wires to connect either. Smart locks comes with a variety of alarms that alert you to different dangers. The most important alarm is the anti tamper alarm which sounds when a person is trying to rip your lock off your door. Many smart locks will be outside and be “open to the elements”. They will need to be weatherproof. Many smart locks have minimum and maximum operating temperatures that they are guaranteed to operate between. For instance, the Schlage BE469 operates between -35 to 66 °C. But like other electrical appliances that are designed for outdoor use, in an ideal world smart locks will have an IP or Ingress Protection rating, which is a standardised rating that all outdoor electrical devices should have. Not everybody’s front door is the same and so you want a smart lock that comes in a variety of different colors. This will allow you to choose a color that fits in with the design and style of your home. Remote unlock is the ability of a smart lock to be controlled via an app on your smart phone. You don’t need to be at home in order to open or control your lock. At its most basic, an app will enable you to open a lock remotely but as the apps become more sophisticated, the number of functions that can be performed will also grow. Since I designed my infographic, I have learned many more things about smart locks. And so, my original list of ten features of the perfect smart lock has grown to fifteen. I haven’t had time to add these extra features to my infographic, but I have described them below. Privacy features relate to locks that are operated by keypads. As well as having an excellent standard of basic security, smart locks should have features built in that keep any security codes or PINs hidden or private. The touch sensitive surfaces of many keypads are resistant to general wear and tear and mark resistant. It is important that the keypad never shows any marks because otherwise an opportunistic thief could see what numbers are most used on the pad and guess the security code. A record log is a constantly updated list that shows when your lock was opened. It is part of the app that you download for your lock. It acts as a sort of calendar showing your lock activity over time. There are two ways in which smart locks make dealing with occasional users a dream. Firstly, by allowing security codes to be created immediately from the app. Secondly by allowing strict rules to be applied to these codes. These rules include the codes only being used on certain days of the week- for instance if you want to create a code to allow your dog walker into your house. Or that the codes can only be used for a week (or a length of time of your choice- in the case of smart locks being used in holiday rentals. After a week the codes “expire” and they will no longer work. Perhaps the biggest advantage of a smart lock is that you don’t have to carry a set of keys around with you. Nor do you need to remember to take your key as you leave the house. In a survey in 2016, house keys were the second most lost or misplaced household item after car keys. A smart lock can be connected to other home security products such a wi-fi video doorbells or smart lights. The security of your home is strengthened when smart devices work together because these products send the owner notifications of any important events and because by working together, these devices create a better deterrent. Smart locks can give immediate access to a door without the need to leave a spare key in a safe place. As an example, if you are delayed at work and a friend was coming round then many smart locks allow you to create an extra security code via an app on your phone. If the lock is really clever, the code can be made to expire after a few hours. Your friend can let themselves in and wait for you in the comfort of your home. Elderly people and people with a disability might find using a smart lock simpler than using a mechanical key. Although this will not be the case for all elderly or disabled people, it could make things easier for lots of vulnerable people. Perhaps the easiest types of locks for older people and those with disabilities are those that can be opened with a fingerprint or by a smartphone. With these locks, there is no security code to remember and no mechanical key to struggle with. Another layer of security and peace of mind that smart locks can offer family members who are more “vulnerable” is a record of when a lock has been opened and by whom. This will help to keep track of people- helping to know that they are safe. Some families need locks that cannot be opened easily from the inside. This can be because of a mischievous toddler who is going through a faze of “making a bolt for it” out of a front door or more seriously it can involving family members with special needs who are a “flight risk”. One solution to this problem is to mount the lock higher or the door so that it cannot be reached. But it won’t stop older children or young adults with special needs or a young child who learns to climb on a chair to reach the lock. A better solution is a double sided keyless lock. These locks have a number pad on the inside and outside of the lock. If you have a smart lock, you do not have to hide a spare key somewhere- in those situations where you forget your own key or you need to let someone else in. Hidden spare keys a huge security issue- and could invalidate your home insurance policy. In 2014, a survey in the UK found that 20% of people admitted to leaving a spare key outside. 19% of those were left under a plant pot and 10% were left under the door mat! Unfortunately, those are the sorts of places that intruders look first! Key less door locks are fantastic for businesses because of the sheer number of people that are coming and going. It is easier to create a new security code than to have a new key cut. Or to delete a security code (that an ex- employee used) rather than try and get their key back from them. With a traditional lock, if you want to stop a key holder from getting in (apart from asking them to not use it) you would normally have to change the lock. Smart locks make this process faster and free because security codes can be changed deleted. Spare keys to be used with traditional locks cost money to get. Although with some smart locks, temporary codes can cost money, generally creating new security codes on a smart lock is free. Most smart locks can be installed with just a screwdriver. Perhaps most traditional locks can also be installed with a screwdriver but I think that the difference is that there are more installation videos for smart locks. Perhaps the most obvious disadvantage of a smart lock is that they are much more expensive than traditional locks. Taking a quick lock at the difference in prices, a Yale deadbolt costs about $35 whereas a Yale smart lock costs about $130. So, in that one example, a smart lock costs four times the price of a standard deadbolt. Most, but not all, smart locks require their owners to own a smartphone. This is because they are needed to directly open a lock as a sort of electronic key or they are needed to access the app that controls many smart locks. Another potential disadvantage of using a smartphone as a sort of electronic key is when your smartphone runs out of battery. It can make getting in the door much harder. Yet another, power- related disadvantage of having a smart lock is when the lock itself runs out of power or has a power failure. Most smart locks are battery powered and as well as having low battery alarms and notifications, they also have a means to open the lock in the event of a power failure. This is normally a mechanical key- which comes with lock. . Shoulder surfing is when someone peers over your shoulder as your enter your security code into your lock. No one can shoulder surf if you are using a traditional lock. But of all the different types of smart locks that there are, shoulder surfing is only a danger to those that involve entering a security code or PIN (personal identification number) to open the lock. Wear and tear is really on a factor for smart locks that are operated by keypads. The danger here is that if the same code is entered repeatedly, than the keypad will show “wear and tear” marks around those specific numbers. This will make it easier for opportunist burglars to guess the correct security code by just looking for the numbers that look “most used”. Many of the latest smart locks have keypads which are resistant to leaving any wear and tear marks. Any device that connects to the Internet, can be hacked. Hacking is a process of connecting to a device and then controlling it illegally. Locks, like many other devices, are vulnerable to being hacked. One of the best pieces of advice is to research the known security issues with your choice of smart lock before you buy it! This show happens every January and it is the place that many of the big tech companies reveal their newest gadgets. There are two trends that I want to focus on. Looking at the newest smart looks, it seems that the next big feature of smart locks will be “in home” delivery. As we buy more products on line, the number of packages that are being delivered to our homes is increasing drastically. Because most of us are out of work, this means that many of our packages are being left on our porches. Consequently, the number of parcels that are stolen from people’s porches has risen significantly. A solution to this is “in home” delivery- allowing trusted couriers entry to our homes so that deliveries can be left just inside our front door instead of on our porch. Amazon (not surprisingly) were the first company to offer such a service, launching Amazon Key in October 2017. Smart lock company August (who are now owned by Yale) ran a limited trial of a similar system last year with Walmart and will launch a nationwide service in the next few months. I think that the second focus for smart locks, is for more of them to work with voice controlled smart home systems such as Alexa, Google Assistant and HomeKit. Of course, this is a growing trend across all types of smart devices to enable them to be controlled by voice commands and to increase the number of voice commands that the locks will respond to. Although the smart home voice systems of Amazon, Google and Apple rightly get lots of attention when it comes to discussing smart homes there are other systems out there (which aren’t voice operated) but which are very widely used. SmartThings and Wink are two examples. Smart locks need to integrate with these systems more so that smart locks can properly interact with other smart home devices, providing smart home owners more robust home security systems. IFTTT or If This Then That is a free and ingenious web app that allows smart devices to connect and work together. Think of it as the icing on a smart home’s cake. Large and established systems like SmartThings, Wink or HomeKit can control the majority of your smart home. But IFTTT works alongside these systems to connect devices that the more established systems don’t allow for. Devices are connected to each other via simple technical “recipes” called applets. Anybody can create an applet to connect devices and lots of device manufacturers have created their own applets on official IFTTT channels. And so, what are my top IFTTT applets for smart locks? 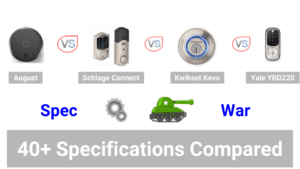 Well I have focused on two of the top smart locks- the August lock and the Kevo lock from Kwikset. The applets that I have included hopefully show the variety of combinations that are possible within IFTTT. Perhaps I am stating the obvious but if you want to connect two devices together you must own both devices! This applet connects your Hue lights to your August lock. When you arrive home and open your August lock, your Hue lights turn on automatically. This applet connects your Wemo Smart Switch to your August lock. When you unlock your door, your smart switch turns on. This applet connects your BMW car to your August smart lock. When your door is unlocked, you will receive a notification on your car's dashboard. This applet connects your SkyBell doorbell to your Kevo lock. When your door is locked, your Skybell will record a short video. This applet connects your phone to your Kevo lock. When your lock is opened, you will receive a phone call. This applet connects your Google Drive to your Kevo lock. When your door is unlocked, it will be recorded on a spreadsheet. As I mentioned earlier, many smart locks can now be controlled by voice commands within such systems as Amazon’s Alexa and Google Assistant. But how exactly can these locks be controlled with your voice? To keep it brief, I will focus just on Alexa. Any smart locks that want to integrate with Alexa, need to have a set of skills created by the lock manufacturer. These skills are very similar to the applets that link devices on IFTTT- they are a technical recipe that allows the devices to connect and interact with one another. check the status of any locks.